Battle Mountain's Gabriela Caballero goes for a layup against Eagle Vally on Tuesday, Jan. 23, in Edwards. The Huskies are 7-7 on the season. Battle Mountain's Liam Hanagan shoots against Eagle Valley on Tuesday, Jan. 23, in Edwards. Hanagan had 16 points in a losing effort. Eagle Valley's Raul Pereida drives to the hoop against Battle Mountain on Tuesday, Jan. 23, in Edwards. The Devils beat the Huskies, 110-102, as Preida had a game-high 30 points. Battle Mountain's Marti Schmidt grabs against Eagle Vally on Tuesday, Jan. 23, in Edwards. The Huskies beat the Devils, 51-39. Eagle Valley's Dale Roybal moves the ball around against Battle Mountain on Tuesday, Jan. 23, in Edwards. 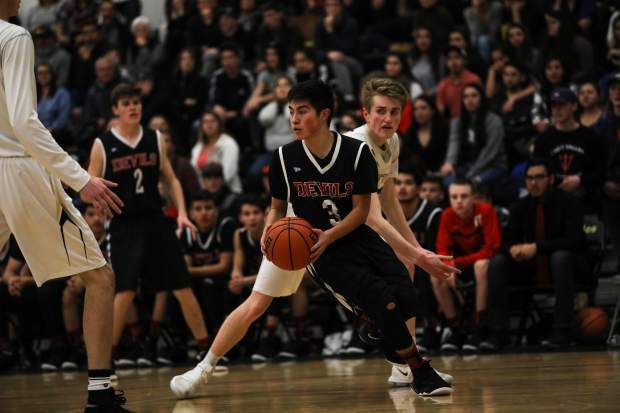 Roybal contributed to Eagle Valley's 16 3-pointers. EDWARDS — The upset was conceivable. The score? Not so much. 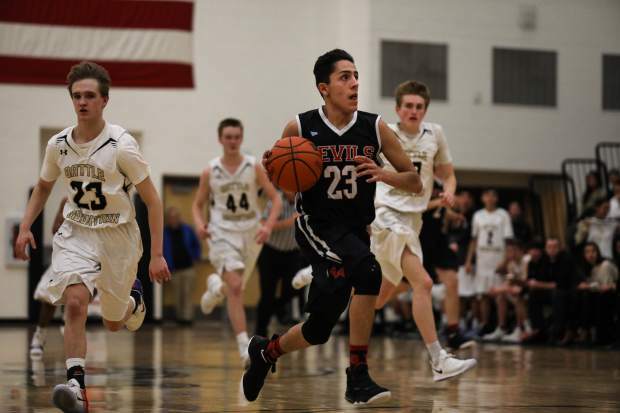 Eagle Valley boys basketball pulled the upset against archrival Battle Mountain in Edwards on Tuesday, Jan. 23. But by a score of 110-102? Yep, Eagle Valley 110, Battle Mountain 102 … in a 32-minute high school game. There was no overtime, people. It didn’t hurt that the Devils knocked down 16 3-pointers. “Really? It felt like more,” Devils coach Chris Walls said. If the winning coach is saying that, then imagine how it felt to Battle Mountain. If anyone had told Huskies coach Philip Tronsrue that his team would score 102 points on Tuesday, then he’d walk away thinking the Huskies won. 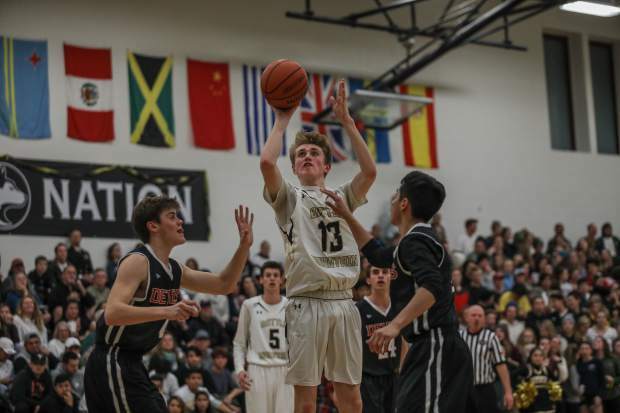 And this is the takeaway — Eagle Valley dictated the tempo, and was able to build its lead to 20 points at varying moments of the second and third quarters. The Devils took Battle Mountain out of its game. Eagle Valley (5-11 overall and 3-2 in the 4A Slope) had Battle Mountain frazzled early with its full-court press and uptempo offense. It didn’t hurt that Pereida (twice) and Carlos Quezada hit NBA-length 3s. And when the Devils popped deep shots, that forced the Huskies to play the perimeter farther up, allowing Eagle Valley offensive lanes to the hoops. On paper, the Huskies have the edge inside, but the Devils neutralized that advantage. The Devils started the second quarter with a 15-0 run. Jake Medina and Pereida both drive to the hole for layups, and, in just one minute. Medina hit twice from downtown with Dale Roybal hit from beyond the arc. Throw in a Pereida layup and the Devils led 41-22. The Huskies (7-8, 2-3) cut it to 45-36 with 2:55 left in the half, but the Devils went off again. Quezada struck twice from downtown and then fed Johnson for a layup. Two Medina free throws had Eagle Valley leading 60-39 at the half. For those of you scoring at home, the Devils scored 36 points in an eight-minute quarter. In the third, Eagle Valley scored “only” 19. This was critical, as it seemed for a while the Devils were going into their second-half nap, the let-down quarter. But Pereida was on fire, hitting another deep 3, Quezada followed as did Medina, the last hitting from the corner right near the Devils’ student section. The eruption was likely heard in Gypsum. Marti Schmidt scores points during a victory in Edwards. 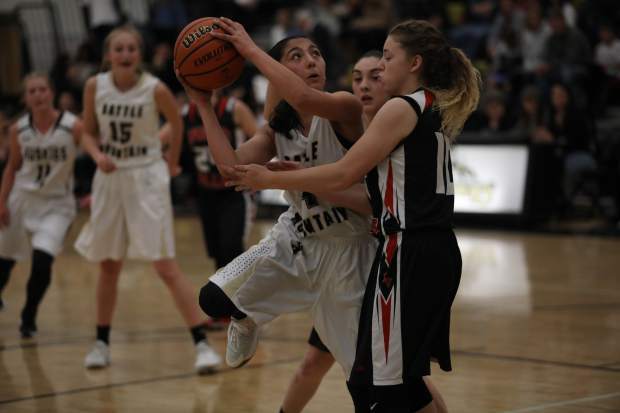 This isn’t exactly breaking news, except for the fact that she was doing it for Battle Mountain in a 51-36 win over Eagle Valley on Tuesday, Jan. 23. 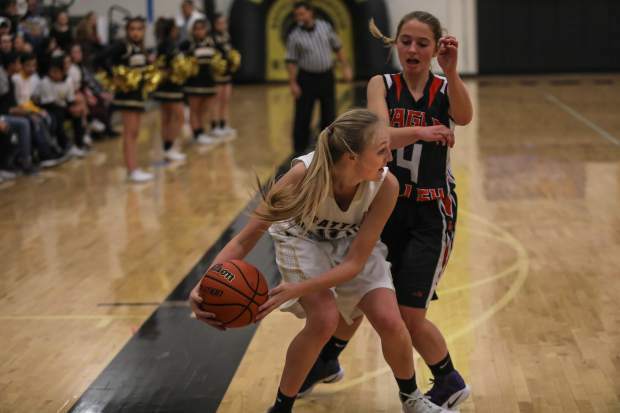 You might remember Schmidt from such previous episodes as, “Vail Christian basketball.” Having sat out half the season, as required by CHSAA transfer rules, she gives the Huskies (7-7, 3-1) another threat in the paint. It should be noted that the Huskies aren’t exactly a bunch of shrinking violets near the glass already with Claire Krueger, Gabriela Caballero and Stephany Hernandez. Schmidt sparked the Huskies, scoring six of her team’s 13 points during the second quarter — a layin from Hernandez, a 3-ball from Audrey Teague and a Krueger shot were the other seven — as the Huskies surged to a 24-17 halftime lead. In the third quarter, Krueger, who led the Huskies with 12 points, took over, draining shots from inside. The Huskies capped the period with another Teague 3 and a 37-25 advantage. With more offensive threats, Battle Mountain may be able to make a surge toward the postseason as the 4A Slope nears the halfway point. The Huskies were 56th in the rating-percentage index going into Tuesday’s game with 48 teams getting berths. As for Eagle Valley (2-14, 0-5), the frustration continues, although the Devils held their own in a very physical outing. Regan Bossow also showed string senior leadership by example with 14 points and a lot of hustle. Battle Mountain’s teams head to Rifle on Thursday, Jan. 25, while Eagle Valley is at Summit County on Saturday, Jan. 27.